Joseph West, St George for England, oil on canvas, 1916. Collection of the Sarjeant Gallery Te Whare o Rehua Whanganui. Purchased on behalf of the Gallery by Mr and Mrs J.A. Neame, 1922. 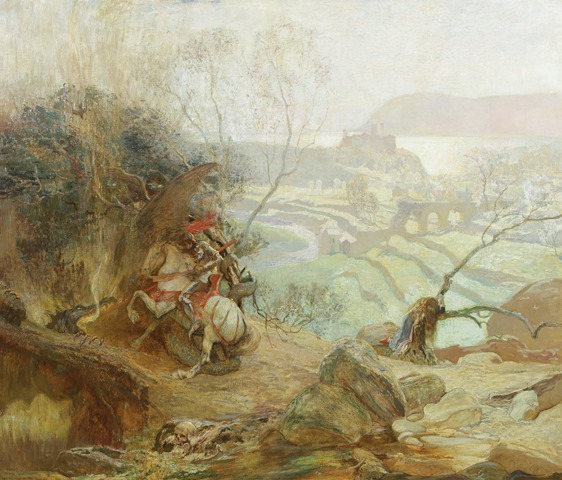 In acknowledgement of St Georges Day on 23rd April have a look at a painting from the Sarjeant Gallery Te Whare o Rehua Whanganui collection that depicts the legend of St George, the patron saint of England. St George for England by Joseph Walter West (1860-1933) was purchased in 1922 for the Sarjeant collection from the artist’s studio in London by Henry Sarjeant’s widow Ellen and her new husband John Armstrong Neame. The painting was recently moved into temporary storage at Sarjeant on the Quay to allow for redevelopment and earthquake strengthening of the heritage Gallery building at Queen’s Park. When you examine the painting you can see the knight in his traditional colours on a white horse with a red plume flying defiantly from his helmet. He is dwarfed by the dark shadow of the dragon’s wing rearing above him as the dragon emerges from it’s cavern, flames shooting upwards from it’s jaws and searing the foliage above. The dragon’s eye cruelly glints as George prepares to land his crippling blow. The distraught maiden kneels against a crooked tree, her head bowed with hands clasped upwards in desperate prayer. In the foreground rest a human skull and bones picked clean, reminding us what awaits should the knight’s quest fail. The myth of St George achieved mass circulation when it was printed by Caxton in a book The Golden Legend in 1483. This version was about a knight, George, arriving at Silene in Libya where a dragon was poisoning the country. To appease the dragon the city was forced to give it human sacrifices chosen by lot. George passed by the city when the king’s daughter was selected, wounded the dragon with his spear and used her girdle to bind about the dragon’s neck.The girl led the defeated dragon to the city where George exhorted everyone to be baptised, after which he slayed the dragon. Little is known about the real George but it is believed he was born in Cappadocia (now in Turkey) in the 3rd Century to Christian parents and later moved to Palestine. George became a soldier in the Roman army and rose to the rank of Tribune. When the Emperor Diocletian (245-313 AD) began a campaign against Christians, George resigned in protest resulting in his imprisonment and torture. He refused to deny his faith and was dragged through the streets of Diospolis (now Lydda) in Palestine and beheaded. Diocletian’s wife was so impressed by his resilience she converted and was executed for her faith. St George and the Dragon has proven to be a popular subject for artists over the centuries as an example of valour, bravery, and gallantry. It was painted by Paolo Uccello and Biovanni Bellini in the 1470s; by Rafael, Tintoretto, and Peter Paul Rubens in the 1500-1600s; and by Edward Burne-Jones and Gustave Moreau in the 1800s. It is even referred to by William Shakespeare in Richard III, Act V as well as in King Lear Act I. The Sarjeant Gallery’s St George for England was painted in 1916 in response to World War I and is inscribed as follows by Joseph West below his signature “IN THE YEAR OF THE GREAT WAR FOR LIBERTY”. Curiously enough a work by Donald Maxwell was painted the same year in the UK and is held in the Imperial War Museum collections. It is entitled St George and the Dragon: Zeppelin L15 in the Thames, April 1916 and refers to the event when a zeppelin was shot down into the River Thames and the surviving crew surrendered.